I've got a lot of things to cover on the ol' bloggity blog today. So, take a deep breath and HERE WE GO! First off, I want to briefly re-cap my Easter weekend outfits for y'all. I traveled back to Charlotte to help lead worship at my old church. They did 5 services this weekend and one was on Saturday evening. So, I had 2 outfits from this weekend. For today's outfit post (which is on a Tuesday, I know...) I'm linking up with Everybody Everywear for their monthly outfit link-up. The theme for this month is PASTEL. Here is an outfit I put together that highlights some of my fave pastel pieces. Gosh, something about peach and aqua together is so gorgeous! 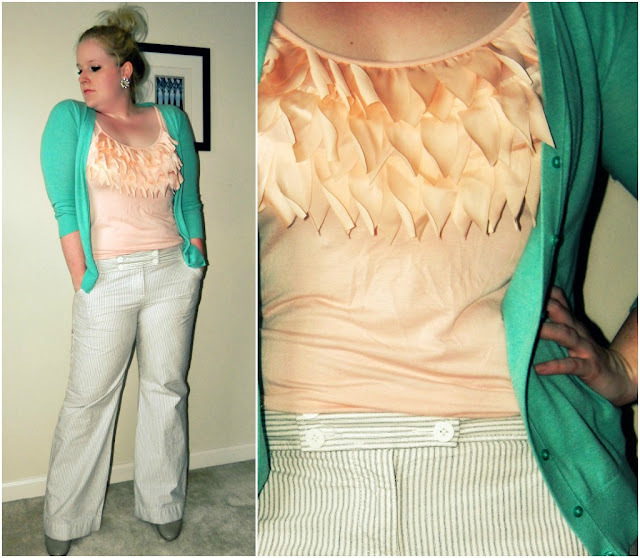 I paired this ruffle-y, leaf-y peach tank with an aqua cardigan and gray and white pinstriped pants. So pastel-y! Oh, and please forgive the hair. It was my lame attempt at a messy topknot. I forgot the cardinal rule of topknots...thou shalt not wear a topknot if thou's hair is finer than Carolina in the morning. So, I tried and learned. My apologies. And finally, here's the treat. Well, maybe it's not a treat for y'all. But, I enjoyed it. The church I helped lead worship at this weekend posted their Easter service online. You can watch it here or I'll (hopefully) embed it below. I lead the 2nd song and solo on the 4th song. I hope you enjoy it! Not Ashamed - How Much More (4.8.12) from GSUMC on Vimeo. Linking up with EBEW and WIWW at the Pleated Poppy. I was at the 10am service, you looked and sounded beautiful! My new coral skirt arrived Saturday so I got to wear it for Easter :) I saw a LOT of coral Sunday morning. I'm glad to know you wore the striped dress to the Saturday service because I was wondering. The Sunday dress is lovely - I didn't realize Hamricks was still around. Thanks Selah! I also saw a lot of coral, so it looks like that was a big color this Easter. I'm glad you got your skirt in time! I was hoping to see the striped dress at church, but alas I needed to come on Saturday for that. I like the look of your top knot. girlfriend you look HOT HOT HOT! :) i love these outfits! they look amaaaaaaaaaazing on you! I should probably clarify...any single male friends? HAHA. Your Easter morning dress is beautiful! I WANT THAT PEACH RUFFLE SHIRT! That pastel outfit is SO cute! I saw this bracelet at Kohls that reminds me of your jelly shoes! Selah, that is so cute and you're right, it defintely does remind me of my shoes. I love your Easter dress! Thanks for stopping by my blog! Did you get a chance to enter my giveaway? Very pretty dress! I like the peach and turquoise too! The striped dress is very cute! Hope you had a great Easter! Love the striped dress from Old Navy- such great spring colors! You have a great sense of style! Love that dress from Old Navy!